Bronx, NY – If you’ve been told you need braces, or that your child needs braces, chances are you have a few questions about what to expect. Dr. Catherine Woo of Riverdale Family Orthodontics offers an explanation of what you can expect when getting braces. Schedule an initial consultation. The first step to getting braces is scheduling an initial consultation with an orthodontist. The recommended age to visit an orthodontist is seven, but it’s never too late to have that consultation. Most seven year olds do not receive treatment, but there are some growth and development issues that can be caught early. If you aren’t sure which orthodontist to choose, you can ask for a referral from your dentist, friends and family, or turn to review sites such as Google and Yelp for the best orthodontists in your area.At this consultation, the orthodontist will do a thorough examination of your teeth. This will involve X-rays, digital images, as well as an exam of the mouth. 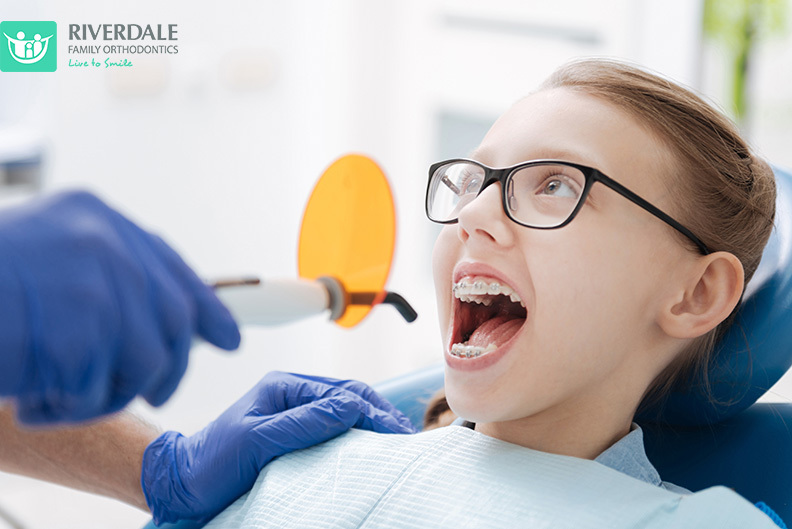 This will show the orthodontist what is currently happening in the mouth, and for younger patients, it will also show what is happening under the gums – where the teeth that still need to erupt are located, and what can be expected to happen in the mouth as the patient grows. Treatment plan, if indicated, is crafted. The orthodontist may find that you don’t require treatment, or that treatment isn’t indicated at the time of the consultation. If that is the case, you may want to schedule recall appointments with the orthodontist so that if treatment is needed in the future, it can begin at the right time to have the best impact. If the orthodontist determines you or your child could benefit from treatment, a customized treatment plan will be created. Every treatment must be individualized for the patient because no two mouths are the same. Treatment option is chosen. Braces options are more varied than ever before, so for many patients, it isn’t only a question of whether or not they need treatment, but also which treatment option will be the best. Standard metal braces are still the most common choice, because they are the most cost effective and they are as reliable as you can get. The good news is, they are sleeker and more comfortable than ever before. But, there are a host of other treatments that may be available to you, as well. Clear or ceramic braces – for patients who want the reliability of metal braces, but without the visibility, clear or ceramic braces are an excellent option. They offer brackets that blend in with the teeth so they are more discreet than standard metal braces. Self ligating braces – These offer the similar reliability as standard metal braces, but they tend to catch less plaque. Because they don’t require ties, there is less accumulation of food around the braces. Invisalign and clear aligners – Aligners such as Invisalign offer a high level of aesthetics because the aligners are made of a clear plastic that is virtually invisible when in the mouth. They are also removable, so patients don’t need to make adjustments to diets and oral hygiene. Lingual braces – These are standard metal braces, but with a twist. They are almost completely invisible because they are placed along the tongue side of teeth. Placing the braces – Once you have chosen your treatment option, based on what your orthodontist thinks will work best for your situation, it will be time to schedule the appointment to have them placed. At this appointment, the teeth will be thoroughly cleaned and prepped to have the braces placed (if you’ve chosen a more traditional braces options, rather than Invisalign). The teeth will be primed for the cement that will bond the brackets to the teeth. Then, once the brackets are in place and the cement has hardened, the wires will be inserted into the brackets. It will take between one and two hours, and while it isn’t painful, there may be some discomfort afterward. It can take your mouth a bit of time to get used to have the braces in your mouth. Oral care with braces in – This is an important step your orthodontist will discuss with you after your braces are on. No matter what kind of braces option you choose, maintaining proper oral care during treatment is crucial. If you’ve chosen Invisalign as your option, the orthodontist will discuss proper wear (they must be worn 22 hours a day to be the most effective), and proper care for cleaning them. Remember: it’s about the technique and amount of time your brush, and not how hard you brush! Comfort while in braces – Your orthodontic team will also discuss how to ensure your comfort while in braces. While the procedure to place the braces isn’t painful, you may notice that your mouth feels a bit uncomfortable in the first few days. It may take about a few weeks for your mouth to adjust. If you have metal braces, you may find the inside of your mouth and your tongue need some time to adjust to the metal in your mouth. If you have any areas that are uncomfortable, you can place orthodontic wax in the area until your mouth adjusts. Additionally, you can take an over-the-counter pain reliever to help with any soreness there may be. You will need to stick to soft foods for the first few days after your braces are placed. Discussion of diet – If you’ve chosen Invisalign, you won’t need to make any adjustments to your diet because the aligners are removable. Simply take them out when eating or drinking, and place them back in after you’ve brushed your teeth to remove any food debris. But, if you’re going with a more traditional type of braces, you’ll need to make changes to your diet to avoid damaging the brackets and wires. Avoid sticky, crunchy or hard foods. Food like apples, steak should be cut into bite sized pieces. No chicken bones or ice should be bit into. Adjustments – If you’re in metal or clear braces, you’ll need to see the orthodontist every few weeks for adjustments. This will ensure the wire is properly configured to guide the teeth to their proper locations. If you are in Invisalign, you’ll still need to visit the orthodontist regularly to ensure treatment is on track. If you or your child are in need of orthodontic treatment, call Riverdale Family Orthodontics today at 718-884-7700. Ceramic, Invisalign or Self-Ligating Damon Braces, Oh My!